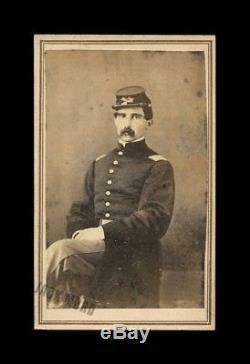 Original CDV, 4" x 2.5", very good antique condition. Infantry insignia on his kepi with a very clear "75". Possibly a soldier named Freeman Parker.. 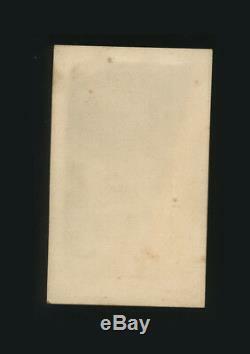 He is not identified and the back is blank, as shown. However, this image was removed from an album with. Nearly all Seneca County, NY studio imprints. In the album next to him was a woman identified as. Researching the woman's name and location, I found an Elizabeth Parker from Seneca married to a. 75th New York Infantry on Nov 26, 1861 and mustered. Out June 22, 1865 in Savannah, Georgia. Captured and survived the war. Him blind in left eye and partially blind in his right. I can't guarantee this is the same soldier.. Might verify his ID, but all things considered I think the name I've given is a very good. The item "CDV of Civil War Soldier Probably 75th NY Infantry Possible ID & POW / WIA" is in sale since Saturday, January 19, 2019. This item is in the category "Collectibles\Photographic Images\Vintage & Antique (Pre-1940)\CDVs". The seller is "jack_mord" and is located in Woodinville, Washington. This item can be shipped worldwide.